Here are some common questions about ELTON, ScanAnything and Fixed Asset Tracker. Download this guide as a general overview of how ELTON is used. System Admins use this document to setup and configure ELTON. 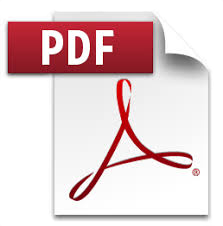 This document covers optional features, setup QR Code label printing, custom settings and much more. Read this through before you star using ELTON. Loading data into ELTON you can use either the Data Import Wizard, APEX Data Loader or Dataloader.io. 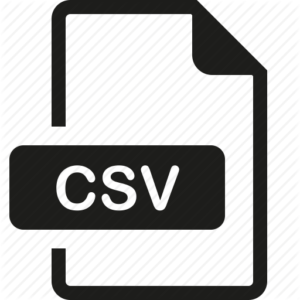 The links here are to our standard Load Template (CSV file) and our guide to loading Equipment, Assignments and Loans into ELTON. A couple of points to note: If you are going to use Equipment Types they need to be loaded prior to loading Equipment, Loading multiple historical Assignments can be done but they must be loaded in chronological order. How do I install the ELTON Reports pack? We offer an unmanaged package that contains some sample reports. You can navigate to the AccountAbility About Us page in the app and you will find two links there for installing the reports pack. The link is different for Sandboxes vs. Production or Developer orgs. 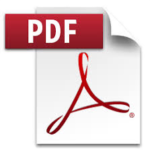 Just click on the correct link and you will be re-directed to the install page for the report pack. Or you can copy and paste the below URL’s while logged into your org. How do I use Barcodes with ELTON? ELTON uses either QR Codes (that we generate) or Barcodes. Barcodes can be existing barcode labels on Equipment or you can acquire pre-printed Asset Tags from label production companies and assign specific barcode values to each Equipment record. Download this guide to using Barcodes for more information on how to use barcodes with ELTON. ScanAnything is a mobile app that runs on your iOS or Android phone or tablet. When you start ScanAnything you login into the same Salesforce org as your Salesforce app. 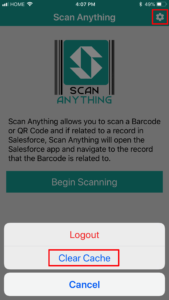 After that if you scan a barcode or QR code ScanAnything looks up records in your Salesforce org that have the scanned value setup in a special field used by ScanAnything. 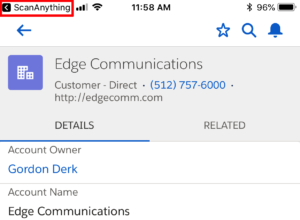 If ScanAnything finds a match it will open the Salesforce app with the matching record open. ScanAnything stays running in the top left corner of your phone so you can tap ScanAnything and go back to scanning mode quickly. You might need to clear cache on the ScanAnything app. If you just added the field you will need to go into the ScanAnything app, tap the gear icon and select Clear Cache. This will tell ScanAnything to re-read all the objects and look for new SA_ID fields. You can also logout and login again. ScanAnything does require that your System Administrator setup fields that are used by ScanAnything. It only takes a few minutes but it need to be done before you can use ScanAnything. Use the System Administrators guide to learn how to setup the required fields and other configuration options. Use this document to get Fixed Asset Tracker setup and installed into your org. How do I load data into Fixed Asset Tracker? Loading data into Fixed Asset tracker is not a complex task, but it does take 2-3 loads in a specific order to accomplish. First you must load the Fixed Asset records, then you can load life to date depreciation. 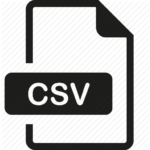 Use the CSV file as your template and read the Guide to loading data carefully. How do I use Barcodes with Fixed Asset Tracker? You can use barcodes or QR Codes with Fixed Asset Tracker and our mobile app. Read this white paper for more details about how to setup barcodes in Fixed Asset Tracker.